UPDATED and with a BRAND NEW DESIGN! 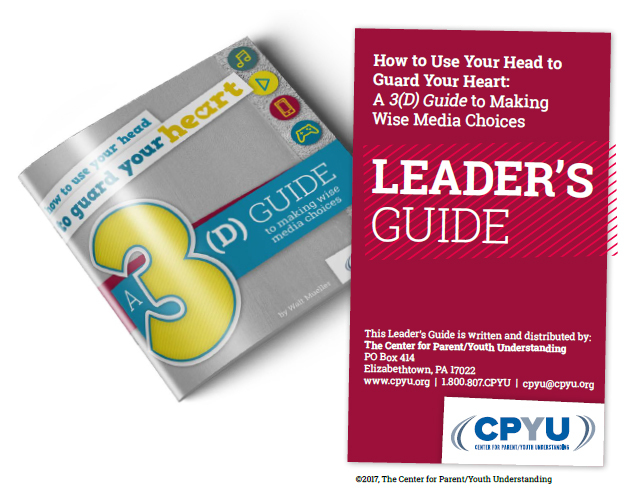 This Leader’s Guide provides youth workers and others with a step-by-step process for walking students through CPYU’s How to Use Your Head to Guard Your Heart: 3(D) Guide to Making Wise Media Choices. It includes ideas for how to better equip your high school and middle school students to become media literate while evaluating media within the context of a Christian worldview. The Leader’s Guide will help you use the 3(D) Guide in a variety of youth group or Sunday school settings, while providing ideas on how to make the 3(D) Guide a regular part of your youth curriculum. You can order copies of the 3(D) Guide in CPYU’s Online Resource Center.